The Old Fourth Creek Burying Ground is surrounded by a low random layered stone wall first build between 1790 and 1800. It had fallen into disrepair and was reconstructed in 1934 by the Civilian Conservation Corps. At that time it was dedicated to the original pioneers who had settled the area and were buried there along with soldiers of the Indian Wars, the American Revolution and the Confederacy. A bronze plaque was placed on the side running along West End Avenue. It is set in a recess in the center of the wall facing the 1st Presbyterian Church across the street. The Spanish American War Veterans and Auxiliary was omitted from the list of those sponsoring the plaque. At a later date a narrow strip of bronze with their name was placed above the original plaque. A second stone plaque to those who were involved in rebuilding the wall was placed nearby. 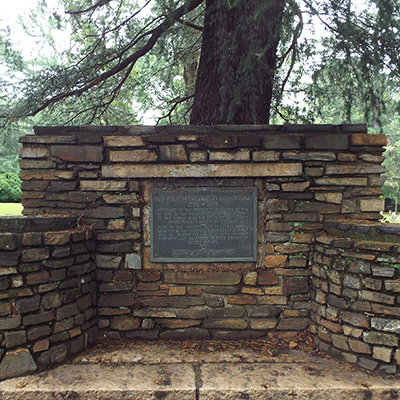 Bronze plaque: OLD FOURTH CREEK BURYING GROUND / 1759-1888 / DEDICATED BY THE PRESBYTERIAN CHURCH TO THE / MEMORY OF THE PIONEERS AND TO THE SOLDIERS / OF THE INDIAN WARS, THE REVOLUTION AND THE / CONFEDERACY WHO LIE BURIED HERE. THIS TABLET WAS ERECTED BY THE COLONIAL DAMES, / THE DAUGHTERS OF THE AMERICAN REVOLUTION, THE DAUGHTERS OF THE CONFEDERACY, THE AMERICAN WAR / MOTHERS AND THE AMERICAN LEGION AUXILIARY. The unveiling was included in the Confederate Memorial Day Service that saw only two Confederate veterans in attendance. Dr. Charles E. Raynal gave a brief dedication speech during which he said, “As we unveil this tablet it is for us to realize that the importance of our act is not only in the preservation of our past history but, much more, in the dedication of ourselves to the same loyalty, courage, honesty, and truth that ruled in the lives of our fathers.” The flags of the Confederacy and North Carolina were on either side of the bronze tablet during the ceremony which included reading of the poems “Stonewall Jackson” and “Conquered Banner.” The service ended with three volleys fired and taps sounded. Controversy arose over the wording of the bronze plaque as first proposed. It appears that it was to include reference to those responsible for rebuilding the wall in 1934. Some felt that all due credit on the plaque should only be given to the early settlers who built the wall originally along with those buried there along with a thanks to the Federal Government for funding reconstruction. A compromise was reached when the workers agreed to pay for the stone tablet from the own pockets and have it placed inconspicuously. The cemetery address is 114 West End Ave, Statesville, NC. The wall runs along West End Avenue and Debow Street. The cemetery is located in an old neighborhood, with mature shady trees and well-maintained lawns.